KLAMER, ARJO. Doing the Right Thing: A Value Based Economy. London: Ubiquity Press, 2017. Pp. xxii, 241. ISBN 978–1–909188–92–1, pbk. ; 978–1–909188–93–8, PDF; 978–1–909188–94–5, EPUB; 978–1–909188–95–2, Mobi. 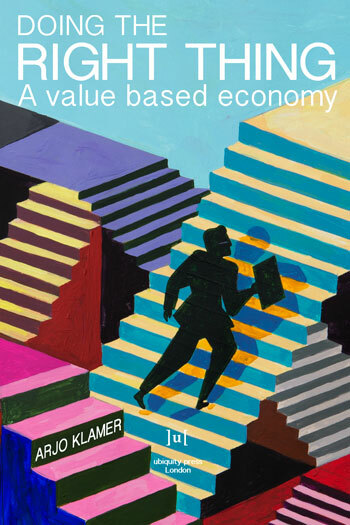 JEL 2017–1318 Presents foundations for a value-based approach to the economy in response to instrumentalist thinking in the current economy, focusing on values and important goods and placing economic processes in their cultural context. Considers what it takes to do the right thing as a person, organization, or society, and what the good should strive for. Discusses how doing the right thing starts at home and how culture matters in the end; different ways of making sense of culture in relationship to the economy; doing the right thing—a matter of realizing values; phronesis—the virtue in making values real; values; procuring goods, the most important of which are shared, in order to realize values; the goods to strive for—our ideals; the sources for doing the right thing and richness and poverty; realizing values in five different spheres—involving others; an exploration of the five spheres—logic, rhetoric, values, and relationships—the oikos and the social and cultural spheres; the market and governmental spheres and the spillovers and overlaps among the five spheres; and so what?—a value-based approach, the standard economy, and the practical use of the value based approach. Klamer is Professor of Cultural Economics at Erasmus University Rotterdam and Lector in Social Innovation at Fontys University. Bibliography; index.